Spitalfields is one of the hamlets in the vicinity of the Tower of London that today make up the Borough of Tower Hamlets and consequently all residents of the Borough enjoy a special relationship with the Tower which means we can gain entry for just one pound, simply by showing a library card. As a result, it is a place that I delight to visit throughout the seasons of the year and each time I discover more wonders. On a recent bright Winter’s day of frost and sunlight I took a walk from Spitalfields down to the Tower, where I found golden leaves scattered across the old yards surrounding the mythic White Tower, gleaming in the light. When William the Conquerer built this citadel nearly a thousand years ago in 1068, there was little else here and while the modern city has grown around it, the White Tower remains almost unchanged. 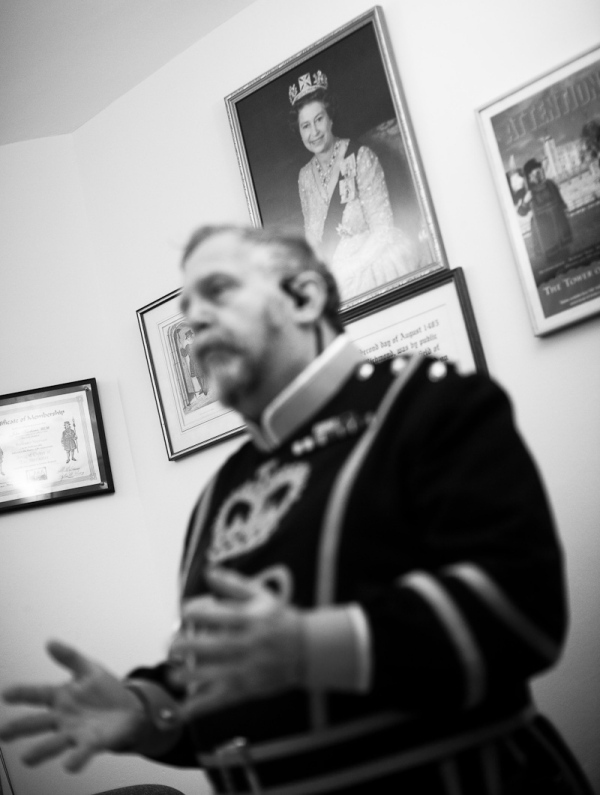 The purpose of my visit was to meet the Chief Yeoman Warder and it was an adventure in itself to be escorted into the inner sanctum of John Keohane’s office overlooking the White Tower, where he sat behind a desk, distinguished in his scarlet and black uniform beneath a portrait of the Queen. John has the quiet eyes of an old soldier, reflecting his long record of military service since 1964, when he signed up for a career that took him to Singapore, Thailand, Oman, the Falkland Islands, Belgium, Germany and Northern Ireland, resulting in a whole string of medals. Though for the sake of levity – in case I should be too overawed by his loftiness – John brought out an iphone from a special pocket in his uniform to show me a picture of him in costume as the Fat Controller on the South Devon steam railway, where he enjoys his month’s holiday each year. In 1485, when Henry Tudor defeated Richard III at Bosworth Field, he brought his personal bodyguard back to his residence at the Tower and appointed them Yeoman Warders. “The privilege is that the appointment is for life,” explained John Keohane who continues this unbroken line of Chief Warders spanning five centuries,“though at New Year we have a toast, ‘May you never die a Yeoman Warder!’” The toast dates from the period before 1826, when the position, which includes accommodation in the Tower, was purchased, thus creating an imperative for the warder to sell out while they were still alive so that their wives would have a pension fund, because you could not sell the position once you were dead. “In Northern Ireland, I served at the height of the troubles, and you were restricted where you could go. You had to be careful.”, John confided to me, with a glance to the window. And I understood that when you have spent your life living in barracks, as he has done, then it is a sympathetic transition to move into the Tower of London, an edifice which contains a veritable city within the City. To be eligible to apply, you must have a minimum of twenty-two years service in the armed forces and a record of good conduct, a fact which John was quick to qualify as being not so much about the lack of misbehaviour as the lack of being caught. 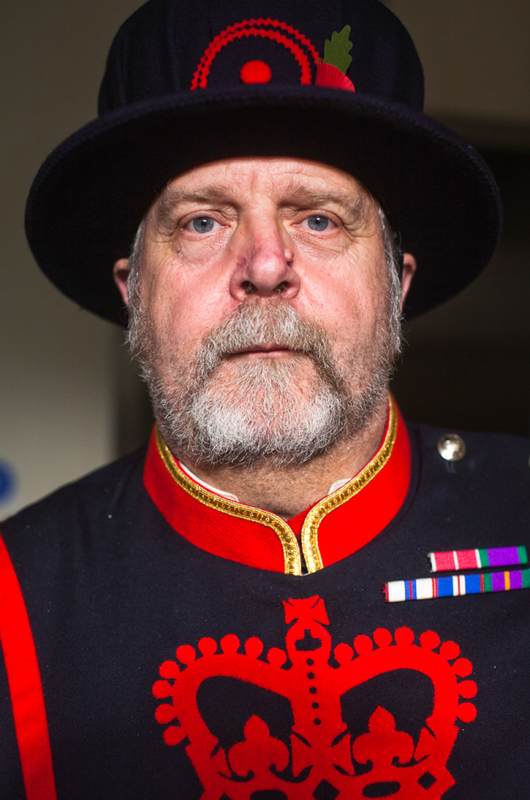 Year in, year out, John lives and works here with his fellow Beefeaters and their families, pursuing an existence circumscribed by duty and ritual. 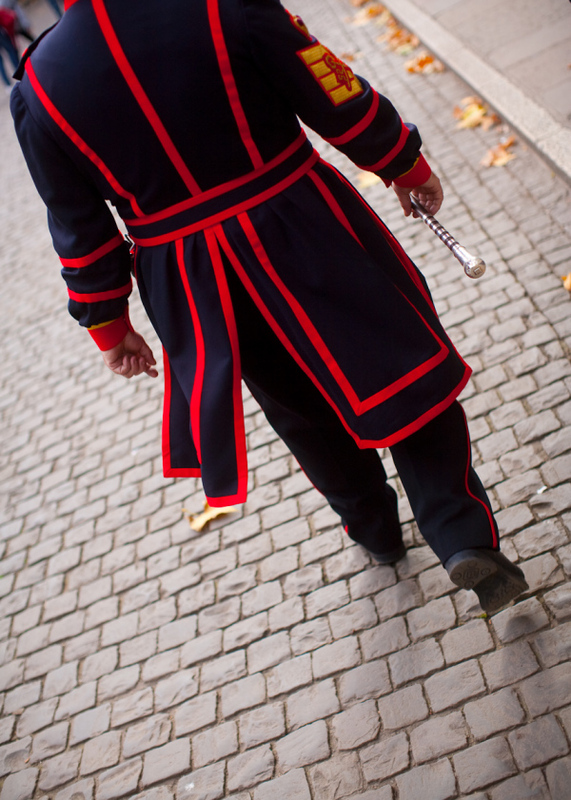 Even the guard rota follows a time-honoured pattern referred to as the “daily waite.” “It doesn’t mean you can’t go out, but you have to follow the rules. People in civilian life would not be satisfied with it.” admitted John, who has made his home inside these walls since 1991. He explained to me that, until 1603, the Tower was a royal residence and his predecessors ate at the King’s table. 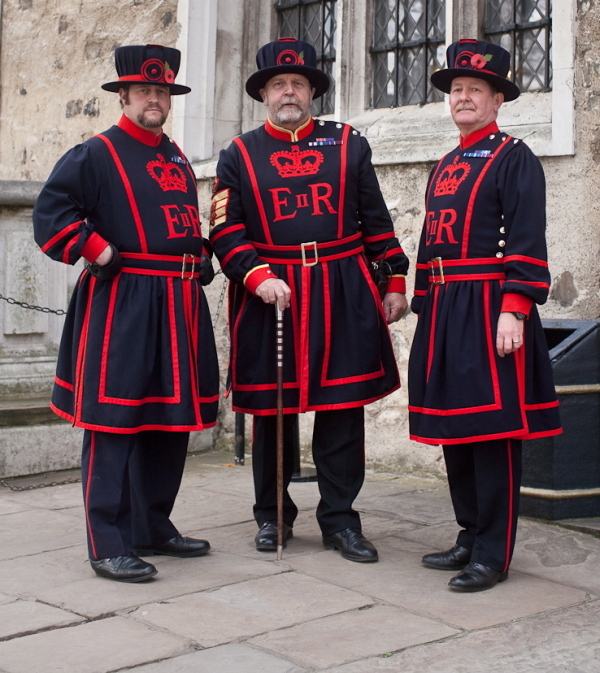 In those days cattle were primarily used for milking and their meat was a luxury food, although beef was served to the King and, by tradition, the Yeoman Warders were entitled to what was left – giving birth to the nickname ‘Beefeater,’ the term by which they are most commonly known today. 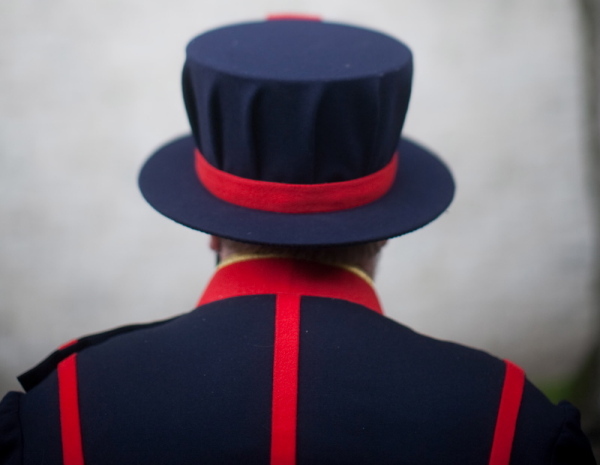 It was the creation of Beefeater London Gin in 1871 which took this name to world with such success that the Yeoman Warders now accept they will always be Beefeaters in the popular imagination. 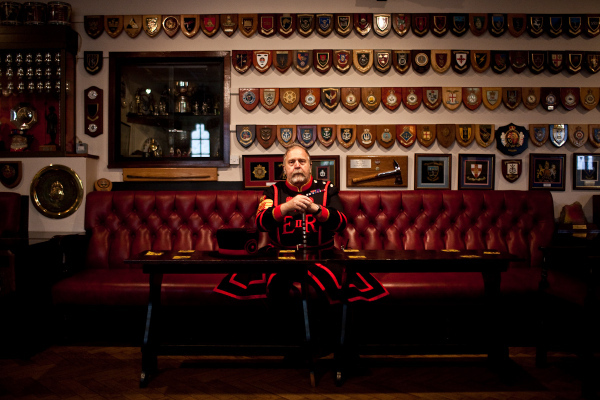 He took me into the Tower of London Club, the private bar lined with hundreds of tributes from all the regiments in which the warders have served, and it was a sober image to manifest the integral connection between the Yeoman Warders and the armed services. Then on another wall I came across evidence of a different kind of recognition, pictures of the Yeoman Warders with celebrities including Johnny Depp, Bruce Willis, Jackie Chan, Barack Obama (John showed Michelle and the girls around), Matt Damon, Bruce Forsyth, Sylvester Stallone, and Paul McCartney. These pictures raised the question of who was being photographed with who. The celebrity with the Beefeater? Or the Beefeater with the celebrity? 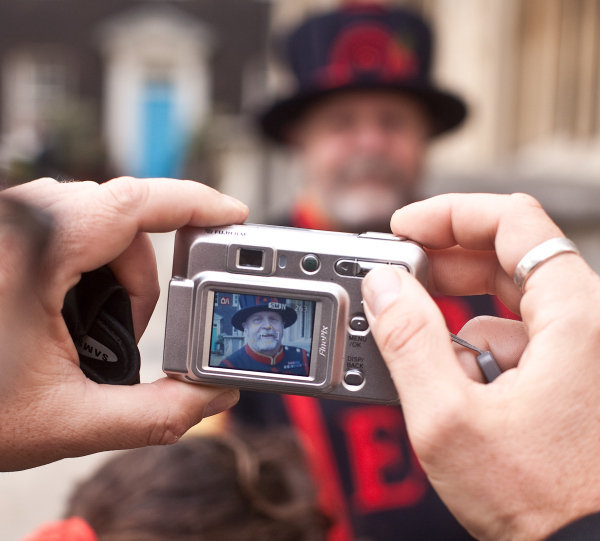 It does seem Yeoman Warders like being photographed with colourful characters, just like rest of us. 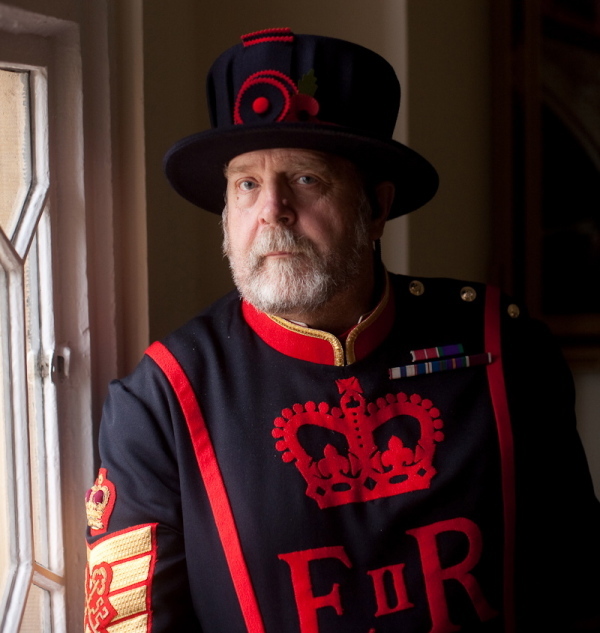 There is an undeniable poetry to this notion of senior soldiers having a new life in the Tower of London, sedate yet basking in adulation of the two and half million visitors each year. Secluded in their cloistered existence but leaving the confines to accompany the Queen at state occasions – existing at the very centre of their own particular world. John says the years pass quickly here. Every night at ten precisely, he supervises the Ceremony of the Keys at which the Tower is locked for the night. Twice a year is the Ceremony of the Constable’s Dues when a visiting Naval ship’s Captain reports to the Tower to pay a due to the Constable of the Tower. Annually in May is the Lillies & Roses Ceremony commemorating Henry VI, the founder of Eton College and Kings College Cambridge, who was murdered at the Tower of London in 1471. Every three years is the Beating of the Bounds Ceremony on Ascension Day when the Yeoman Warders visit all the boundary markers in a circle around the Tower to beat them with willow wands. And every five years a new Constable of the Tower is installed as the monarch’s representative at the Tower. 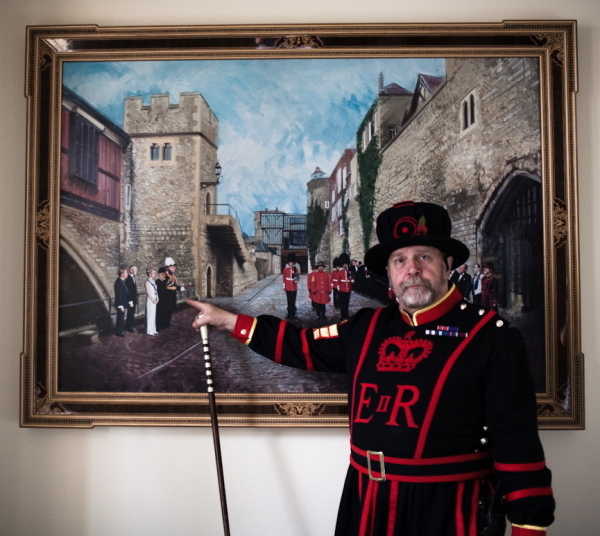 Aware that his twenty years dwelling among these ancient walls is a mere blink in their nine hundred year history, time runs smoothly for John Keohane, Chief Yeoman Warden of Her Majesty’s Royal Palace of the Tower of London. John Keohane points out the figure of the Sultan of Oman in this painting of the state visit to the Tower, of special significance to John because he served in Oman in the seventies. I like all your stories but this one in particular ! and there’s even a picture of him in his uniform. Regards to John Keohane ! This is a great website, I am a new subscriber, I love London, looking forward to this. These men are the salt of the earth. I think we sometimes forget that they’re not just there for spectacle and for tourists to photograph! Nearly 50 years ago in New York City a group of gentlemen who were, among other things, dedicated gourmets, took note that there was in the UK a Beefeater club that celebrated British culinary arts. One of these American gentlemen was the distributor of Beefeater Gin in the United States. It was his suggestion that a similar American club be started. Many of the rituals and the ceremonies at the new club’s twice yearly banquets mirror, in a light hearted way, those of the Yeoman Warders of H.M.’s Tower of London, down to the closing Ceremony of the Keys. 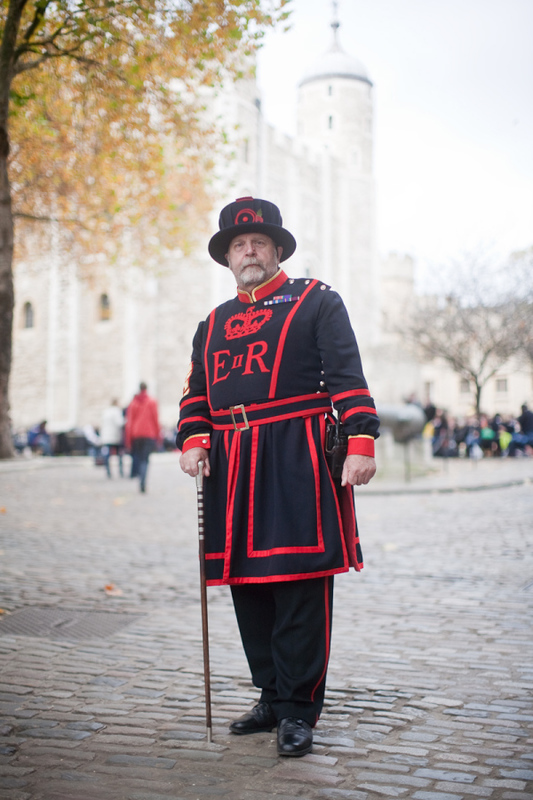 Warm relations were quickly established with The Tower and the Company of Yeoman Warders. Once every five years the US club holds its black tie banquet in London with side events at the Tower with the Beefeaters. Annually we present a financial contribution for the maintenance of the Tower. Ten years ago it was my great pleasure to present to Chief Yeoman Warder John Keohane the American club’s first and only Honorary Membership, at our London Banquet held in Trinity House ovrlooking the brightly lighted palace and fortress. The certificate partially appears to his left in your second photo of John standing in his office. We have flown John to San Francisco for a banquet and then on to Chicago for another dinner by our members there. 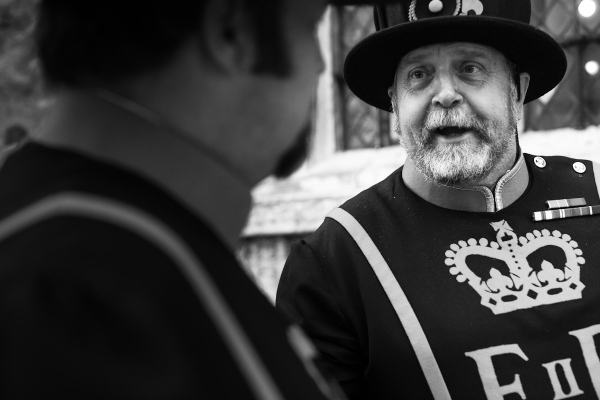 It is with tremendous pride that we celebrate our affiliation with the Body of Yeomen Warders, the high standards to which British gastronomy have risen and the commraderie between our 150 or so American Beefeater Club members share with the Tower and all who live therin. There is no more deserving an individual for your excellent tribute to the Yeomen Warders of the Tower than Chief Yeoman Warder John Keohane. To underscore that comment, our club membersand their ladies from throughout the US, and some from the UK, will gather on 22 October next year in Seattle, Washington, for a celebatory banquet honouring my dear friends, John and his extraordinary wife Ruth. Thank you for another interesting, ‘behind-the-scenes’ post! Also what great responses you have prompted from Ron and Donald. Love the photos of John Keohane but there was one missing – the celebrity Gentle Author with the warder . I have been looking for old comrades from my Army days but I could never find John whom I had served with at HQ AFCENT in the early 80s I was a young soldier then, and John was my Troop Staff Sergeant, he was a great man then and seeing him doing the duties he is doing today makes me very proud to have served with him. Martin Firth…227 Signal squadron Liney. Amazing to see John on this role and well done to him. I believe he was a Sergeant at The Army Apprentice College, Harrogate when I was there as a boy soldier in the late 70s and early 80s. I recently toured the Tower and was most impressed. Please tell me what is the meaning of the “E II R” is on the gate and your uniforms. I am trying to trace an old school friend who married a John Keohane about 1970. Her name was Ruth Buchanan. I know they had a daughter Paula and later a son, whose name I can’t remember. Should this be you I would be pleased to hear from you. I would think that the lights of the Tower shine a bit dimmer with Chief Warder Kohane’s retirement. I hope he is enjoying it. He looks like a charming fellow . He succumbed to a brain cancer on 11-1-13 and is buried at Euless, Texas. I have also lost a good friend. Tel 01273480579 for any further information. For the information of those that knew him and not for retention,please. Is it possible to locate which Tower a prisoner was held… about 1660 . Edward Gove sent from the colony of New Hampshire to the Tower….? Jackie your grandfather was in the tower 1838 to 1869 his name is on the roll of honour. Just dropping in to say “Hello John Keohane” and request contact with you (primarily for family research as well as any military coincidences).